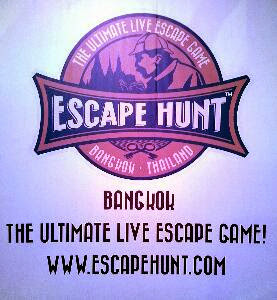 During our weekend getaway in Bangkok, Thailand, dear hubby suggested we try out this live escape game called Escape Hunt. If you're into the popular online Escape Room games, you're sure to enjoy this. Escape Hunt is very much similar to the online Escape Room games where players have to find clues and solve the mysteries before finding their way out. In Escape Hunt Bangkok, there are 3 types of game scenarios to choose from, namely The Murder Mystery, The Robbery and The Bangkok Bomb. The latter is not contained within a locked room and players have to find the clues within the building. Since dear hubby and I dislike running around looking for clues, we chose The Murder Mystery. We managed to escape the locked room within 58.1 minutes. A close shave indeed! The Murder Mystery storyline involves a famous Thai lady who was murdered years ago but the murderer was never found. Obviously our task is to find out the murderer and clues to escape the looked room where the Thai lady was murdered. Each game duration is 1 hour, with a minimum of 2 players. Each player pays 900 THB but price is cheaper with more players. If player is stuck, he may request for clues, with each clue costing him 1 minute being deducted from the 1 hour play time. No bags, mobile phones and cameras are allowed in the room so I couldn't snap any photos during the game. Nevertheless, it was a very fun game and I highly recommend it. Currently, Escape Hunt has 9 outlets around the globe. The 10th outlet is targeted to open in Singapore next month. Yay! We are definitely going to try out the Singapore outlet when it opens. For The Murder Mystery game *guidelines, click here. *Note: I'm not going to spoil the game by stating the clues locations. Guidelines stated are just to prep players. Labels: Sweet vacations, Wow! Check these out!